Drip tape being installed. Photo: L. Schwankl. Drip tape subsurface drip irrigation (SDI) systems that are typically used for annual row crops range from systems that are entirely below ground to those in which some portion of the lateral line (the head end and possibly the tail end) is exposed. One common design is to use layflat or oval plastic hose to supply the drip tape laterals. The drip tape may be connected directly to the layflat or oval tubing, but often the transition between the layflat/oval tubing and the drip tape consists of a few feet of drip tubing and the appropriate fittings. This transition area is an excellent place to take pressure or flow rate measurements. It is not common to find drip tape lateral ends exposed, but they may be if the laterals are to be flushed by hand. If the drip tape ends are exposed, they are an excellent place to take pressure measurements. Frequently, the drip tape lateral ends will be manifolded together to allow a group of lateral lines to be flushed together. This flushline manifold system is below ground, except for the flushline discharge valve, so the lateral ends are not accessible for pressure measurements. If the SDI drip tape system is entirely below ground, with neither the head nor the tail end of the lateral lines exposed, you may not be able to do an effective self-evaluation of the system. Under those conditions, pressure measurements at those mainline, submain, and flushline locations that are exposed may be the best that you can do. 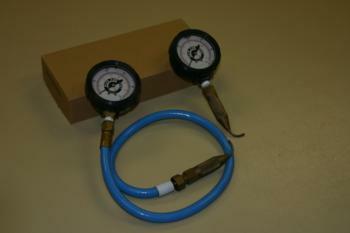 Pressure gauges with attached pitot tubes for measuring pressure inside drip tubing. Photo: L. Schwankl. If the head or tail ends of the drip tape laterals are exposed, you may also take pressure measurements at the exposed locations. A 0 to 30 psi liquid-filled gauge or digital pressure gauge should be used. It should be fitted with the appropriate drip fittings or a pitot tube to gather pressure measurements. The pressure gauge with attached drip fittings are used if a drip fitting in the drip tape SDI system can be disconnected and the pressure gauge connected temporarily for a pressure measurement. A pressure gauge-pitot tube system is used when there is a section of drip tubing (usually at the head of the lateral line) in which you can punch a hole using a drip emitter punch. You insert the pitot tube into the hole, take a pressure measurement, and then plug the hole with a "goof plug." The utility of the pressure measurement information you can gather from an SDI system is limited due to there being so few locations at which you can take measurements. If you only gather measurements at the head end or tail end of the tape lateral lines, these pressure readings should be consistent in value. If they are not, there may be too great a loss in pressure along the mainlines and submains. Another possible explanation for significant pressure differences is leaks in the system. Leaks may be evident during a field inspection but some may go undetected. If you take pressure measurements at the head and tail of the tape lateral lines, the pressure distribution along the mainlines and submains (it should be nearly constant) can be determined, and the pressure losses along the length of drip tape can also be measured. By referring back to the manufacturer's technical information, you can determine whether the pressure loss along the tape lateral is acceptable for maintaining good tape discharge uniformity. Direct measurement of SDI drip tape discharge is not practical. It is simply too difficult and time consuming to uncover the drip tape lateral lines and take measurements. This leaves the use of flow meters as the only means of assessing drip tape discharge rate. While pressure measurements are useful for evaluating the system, it is only by measuring the discharge rate that you can really measure the degree of clogging. Two flow meter options are available for measuring discharge rates in the drip tape laterals. First, a single flow meter installed at the head of the system can measure the total flow. If pressure is held constant, changes in this flow rate can provide important information. For example, an increase in flow rate may indicate leaks in the system. A decrease in flow rate over time may be indicative of clogging. One disadvantage of using a single flow meter is that if there is an indication of a problem, the single meter does not indicate the location in the system where the problem is occurring. Small flow meter in a drip lateral line to monitor for clogging and determine the application rate. Photo: L. Schwankl. 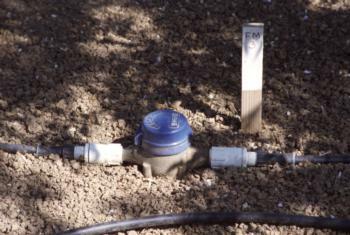 A second option is to use either temporarily- or permanently-installed small flow meters on selected lateral lines. These will work so long as there is an exposed section at the head of the lateral lines where they can be installed. The lateral line flow meters, often ¾" throat diameter meters, are readily available and cost approximately $75. 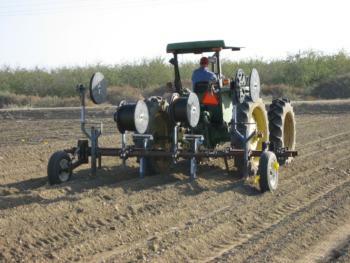 Installing one of the smaller flow meters for every 2 or 3 acres is a practical plan, balancing cost and utility. Lateral line flow meters are more sensitive to flow rate changes than the single meter at the head of the system so they can detect clogging more readily. Since these flow meters record a totalized flow, you must keep track of the operating time in order to determine the actual flow rate to the lateral line. "I have a clogging problem and I want to solve it”.